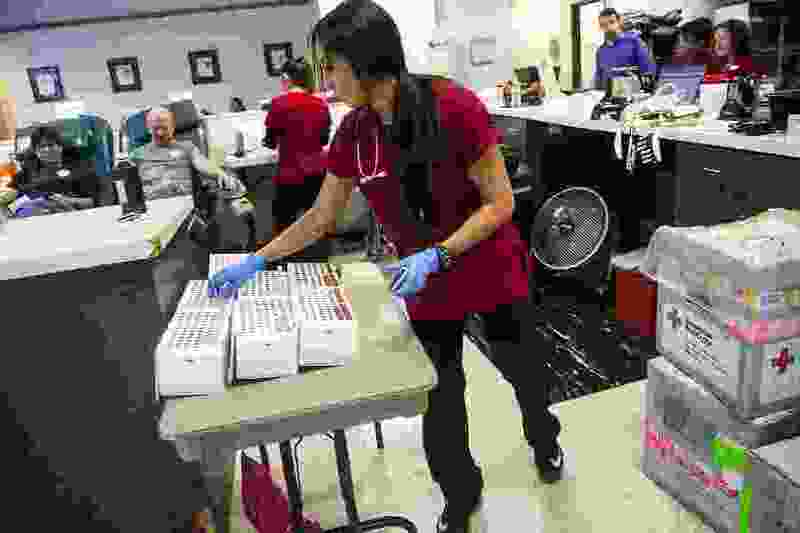 (Chris Detrick | The Salt Lake Tribune) Phlebotomist Christen Lopez organizes blood samples at the American Red Cross Blood Donation Center in Murray Tuesday, Oct. 3, 2017. Blood supplies are running low, locally and nationally. The organization has put out a call for blood and platelet donors of all blood types. Donations have dwindled during the summer months. It’s happening across the country, but it’s amplified in Utah because of the holidays. “It’s a little tougher for us locally, because we have both July 24th and July Fourth,” said Sheri VanBibber of the Red Cross. “But the need for blood hasn’t changed. Not only are there accidents happening that the hospitals need blood for, but there’s just the everyday surgeries and the leukemia and cancer patients that are at risk the most, and we definitely need to have blood there for them." The Red Cross has been on “urgent need” status since last week. “I came an extra time because of the shortage,” he said. Amanda Johnson, a seventh-grade math teacher at Eisenhower Junior High in Taylorsville, came in to American Red Cross Blood Donation Center in Murray to donate platelets for the first time. And each donation can help multiple people in need. The Red Cross sends out emails telling donors where their blood has gone, or donors can download the Red Cross app and follow their blood that way. To make a donation, go online to RedCross.org to find the location of a blood drive near you. You also can make an appointment to donate at the American Red Cross Blood Donation Center at 6616 S. 900 East, Murray, online or by calling 800-733-2767. There are other locations in Ogden, Provo, Orem, Layton and Logan. “We need every donor we can get,” VanBibber said.